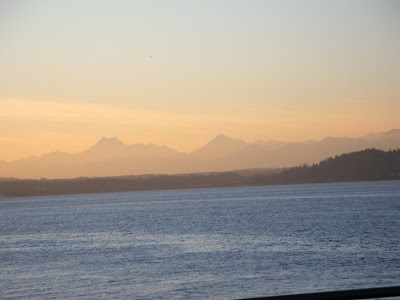 It's sunny and 52-degrees this morning with cloudless blue skies -- so clear that you can see Whistler Mountain, the site of the 2010 Winter Olympics -- shimmering in the distance to the north across the deep blue Straits of Juan de Fuca. If you're intrigued by the news coverage on our corner of the world and are possibly contemplating the Pacific Northwest as your next vacation destination, you don't want to miss the spectacular Olympics that host visitors from around the world every day of the year -- the Olympic Mountains, the Olympic National Park and the Olympic Peninsula. The Olympic National Park is a World Heritage Site and an International Biosphere Reserve. With 37 peaks well above 7000-feet, the Olympic Mountains are breathtakingly beautiful, rugged and remote. They remain isolated from development with not a single ski resort to mar pristine views of the wilderness. Be sure to check out our December 2009 Blog below where we provide Insider Tips on the Olympic Explorer Loop that will take you from the rain forest and waterfall trails here on the Olympic Peninsula, to the charming city of Victoria B.C., followed by a magnificent ferry crossing to Horseshoe Bay and finally up the Sea-to-Sky Highway to Whistler and Garibaldi Provincial Park. Of course, it is inspiring to watch the 2010 Winter Olympics. Congratulations to all the athletes and their families for the years of sacrifice, dedication and hard work that have led to their Olympic moments. This year come to the amazing Olympic Peninsula and Olympic National Park and make some Olympic memories of your own to treasure for a lifetime.